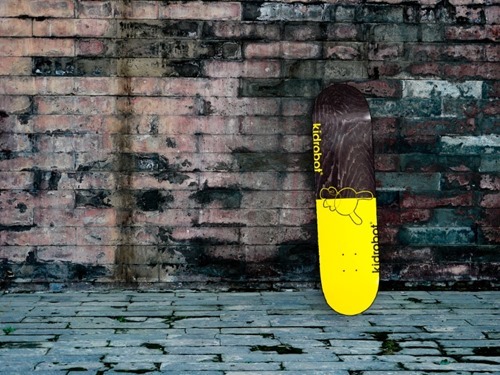 In a bit of a surprise, Kidrobot has announced and released its brand-new Dunny Skate Deck. The half and half, black+yellow design features a Dunny in out line form in the middle with KR logos on both edges. As a nice touch the wood grain shows through on the black side. The underside leaves the wood to shine on its own. 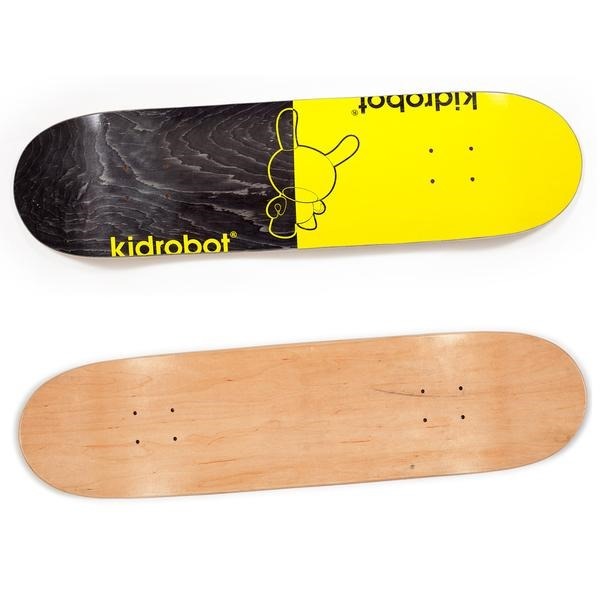 The deck is available for $49.99 from Kidrobot.com. Perhaps we’ll see more KR lifestyle in the future? Joe Ledbetter has collaborated with Hi My Name is Mark on new octopus skate decks in two signed editions—blue + yellow and pink + light blue. 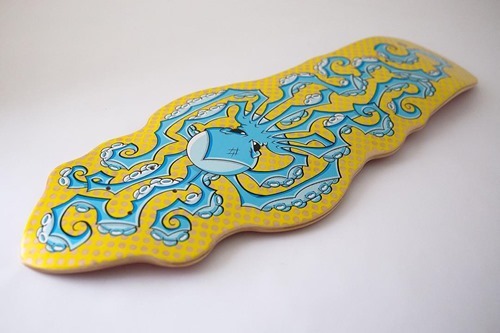 Since Mark Hoppus’ (of Blink-182 fame) personal mascot is an octopus, the organic-shaped deck features JLED’s angular take on the deep sea denizen. The sharp lookin’ decks drop Thursday (5.26) @ 10 AM PDT from the HMNIM online store for $80 (+ s/h) each. 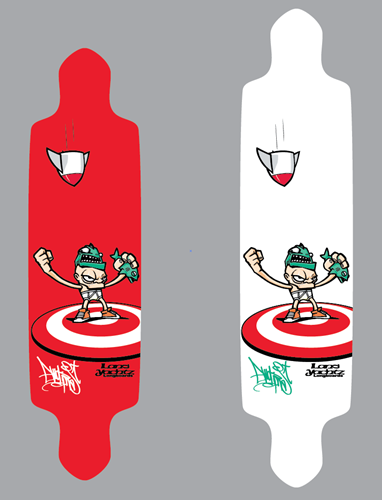 French artist Fakir has released a limited-edition Buring Dojo Deck’On three-deck set with the folks at Last Concept. Based on a hand-painted custom, Burning Dojo features an edgy take on Sushi with hand-signed and laser-engraved numbered pieces. 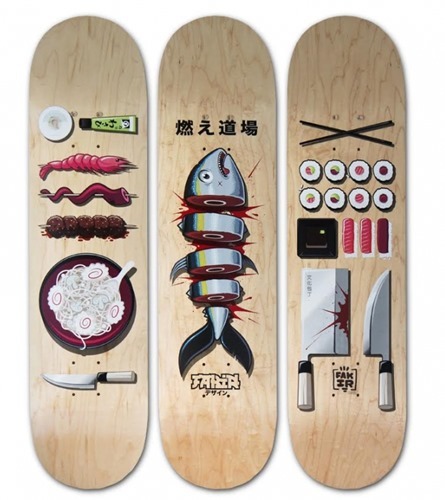 Limited to 30 sets, this Sushi ‘n Skate mashup is available now at Last Concept for 350 Euros (~ Us$381). Looks like Ewok will be collaborating with Landyachtz on a signature series of long boards. Sweet visuals. Andrew Bell is warming up his Dead Zebra store... On Friday (8.24), he'll be stocking his Black Lotus Kanser (ToyQube) figure as well as a new Black Lotus skate deck. 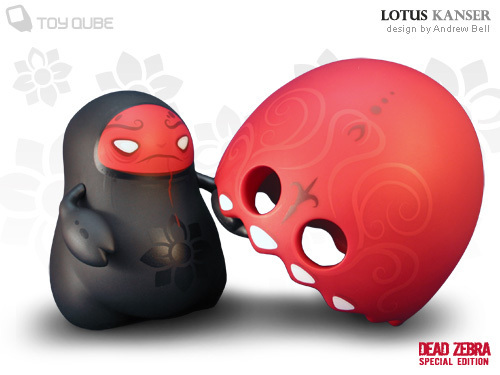 The Black Lotus Kanser is limited to 200 pcs, each signed and numbered figure will be available for $55.00 with a limit of 2 per customer. The Black Lotus deck featuring a six color print on 7 ply Canadian Maple (31 3/4" x 7 3/4") is limited to 100 total pieces and will go for $75.00. Forty of these will be available from Dead Zebra with the other sixty showing up shortly at designer toy and specialty retailers. Fungus Queens produced by Pop Cling is Attaboy's very first limited-edition deck. His patience has paid off. Limited to 100 pieces @ $75 each, the deck looks extremely nice with a vivid design. This deck and all of the Pop Cling decks come with a print/certificate of authenticity (w/bio and deck number) for added collectability and ship in a silver shiny polybag. If you're walls are pale and sad, spice 'em up with a dose of Attaboy's Yum Candy. Get it from Attaboy's web store or Pop Cling. mphlabs is set to drop three hot new decks by UPSO, Sket One, and MAD. Each deck is limited to 75 pieces, will drop in July/August, retails for $60 and is distributed by myplasticheart. Each of these decks is nice, with UPSO's standing out on the strength of his experimental design. There's been a lull in deck releases, so it's good to see a reputable company step up and expand their offerings. Annie Owens is co-founder of the excellent Hi-Fructose magazine and a talented painter. 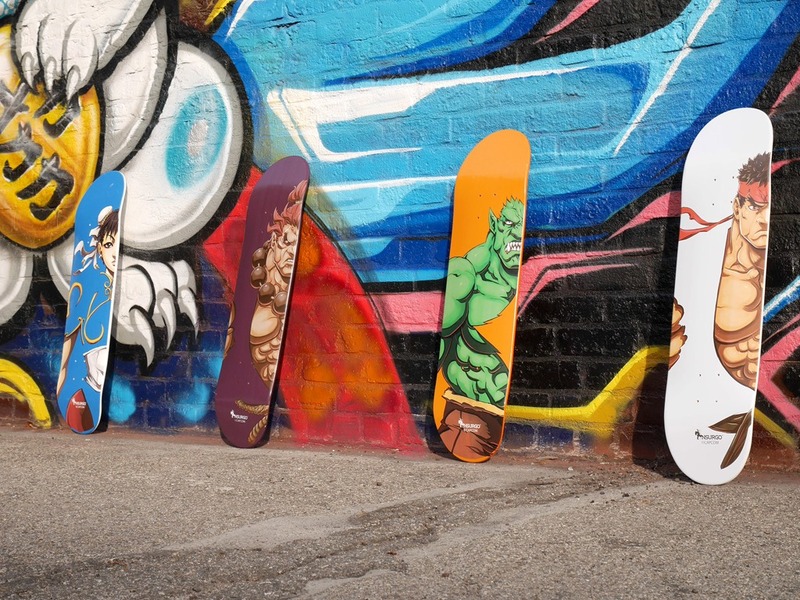 Check out her serious chops on these hand-painted skate decks (acrylic on maple). These have an appealing visual style and super clean execution. Most of these are still available at ouchclub.com.